Specially designed to work in the Pro Training System, these convenient 4 lb weights firmly secure Pro Training Agility Poles, Arcs, and Goals on any surface. The wait for better weights is over. Constructed with high-quality, durable rubber and designed to work with the Pro Training System, these 4 lb weights firmly secure Pro Training Poles, Arcs, and Goals on any surface. These high-quality weights are built to support the Pro Training System, which provides the support you need to build better players. 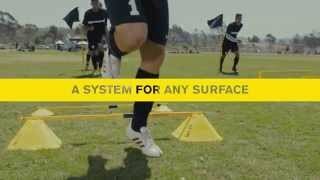 Designed to work on any surface—grass, turf, courts and more—the Pro Training Utility Weight provides firm footing for the poles, arcs and goals in the Pro Training System. Besides holding poles and arcs firmly on any surface, these weights fit on the front bars of the Pro Training Goals for added balance, helping them stand up squarely to more powerful shots.